Finally, I found it. I should have guessed it would be from Alton Brown, one of my favorite and most trusted chefs ever. Once I made this recipe, I decided further research was really no longer necessary: this became my go-to brownie recipe. I would periodically have affairs, trying out different brownie recipes because they sounded interesting, but I always came back to this one. It’s decadent, fudgey and flakey, and definitely needs a cold glass of milk to wash it down. So when I was asked to provide some desserts for my step-brother’s wedding, this went on the list without question. I knew the bride had a serious thing for chocolate and this was the most decadent, fast dessert I knew I could pull off. I hoped I’d get to take some home, but the guests snapped them up to take with them. 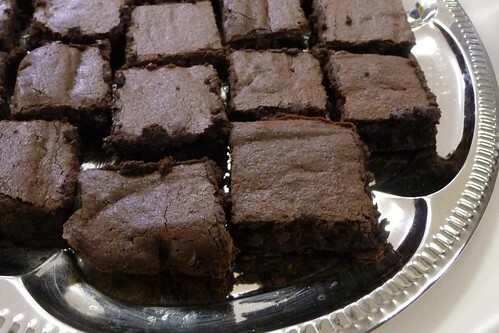 I love these brownies, and I hope you love them too. Makes few, some, or a lot — depending on how you slice it. Preheat the oven to 300 degrees F. Butter and flour an 8-inch square pan or lay a sheet of parchment in the pan, leaving the sides high enough to grab as a handle. In a mixer fitted with a whisk attachment, beat the eggs at medium speed until fluffy and light yellow. Switch to the beating blade. Add both sugars. Add remaining ingredients, and mix to combine. Pour the batter into the pan and bake for 45 minutes. Check for doneness with the tried-and-true toothpick method: a toothpick inserted into the center of the pan should come out clean. When it’s done, remove to a rack to cool for about 5 minutes, then lift the parchment out of the pan and allow the brownies to cool on the rack. Resist the temptation to cut into it until it’s mostly cool.